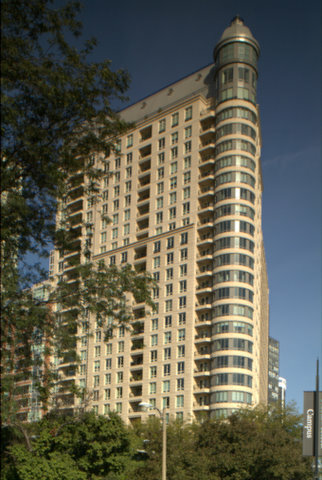 840 N. Lake Shore Drive or "840 on the Park" is a Lucien Lagrange inspired modern version of a 19th century Parisian stone tower. Construction was completed in 2004, 840 on the park prominently stands 27 stories tall. The building is clad in limestone and covered by a zinc mansard roof. The building's design incorporates recessed balconies and a nearly full cylinder of bay windows at Southeast of the building. The views at 840 on the Park have unobstructed lake and central city exposures. With a total of 73 residences, ranging in size from 2,100 to a 8,700 square foot penthouse, those residents that call 840 N. LSD home have been spared no creative expense. The building amenities include a penthouse promenade level and climate controlled wine storage facility for all residents. All homes incorporate outdoor terraces and the building is capped by one penthouse. The bedroom options are two, three, and four bedroom condominiums.